The use of tobacco products is one of the leading risk factors for various chronic diseases and death in Clark County and the U.S. As a healthcare provider, you have an opportunity to make a significant contribution to reducing tobacco use among Southern Nevada residents. We invite you and your staff to incorporate the use of brief intervention strategies when caring for patients who use tobacco products. Tobacco use is responsible for more than 480,000 deaths annually in the U.S., resulting in more than 5.6 million years of potential life lost. According to the CDC, tobacco use in Nevada results in approximately $565 million in health care costs annually. The health benefits of quitting smoking are substantial and include a reduced risk of heart attack, stroke, lung and other cancers, and chronic lung disease. Despite the enormous health consequences of smoking, and the benefits of quitting, 11.4% of adults in Nevada continue to smoke. Assist the patient by offering medications to aid in quitting and/or referrals to online and telephone-based programs such as the Nevada Tobacco Quitline at 1-800 QUIT NOW. Because smokers frequently state that a healthcare provider’s advice is a strong motivator for making a quit attempt and remaining abstinent, the impact you can have on a patient’s smoking habit cannot be overstated. Please help us to reduce the use of tobacco in Nevada, so that together we can protect and improve the health of your patients and their families, by ordering the free materials and incorporating brief intervention strategies into your practice. The Brief Intervention “5 A” approach for clinicians was developed by the Agency for Healthcare Research and Quality (AHRQ) to address tobacco use with clients regularly and efficiently. The intervention is repeated at every visit with a client and can easily be integrated into the current interaction between provider and client. The condensed approach, utilized here as a “3 A” approach, includes the following steps: Ask, Advise, and Assist. The entire intervention should take minutes. How does the Brief Intervention work? The first step, Ask, includes asking the client about their tobacco use at every visit in order to determine if the client is a current or former tobacco user or has never used tobacco at all. The clinician will also determine the form of tobacco used and the frequency of use. The clinician should document the tobacco use status in the medical chart for quick reference at later visits. This step is often done by a nurse, or other health care provider, during other routine vital sign checks. The second step, Advise, includes urging and encouraging every tobacco user to quit using a non-judgmental approach. Tobacco users who have failed in previous quit attempts should be reassured that it often takes repeated quit attempts before being successful long-term quitters. This step provides the clinician with an ideal opportunity to employ the teachable moment by linking medical findings or exploring the client’s current health condition and prescription usage with advice about the benefits of quitting. The third and final step is to Assist. If it is determined during the first two steps that the client is interested and ready to quit, the clinician should link the client with appropriate resources and provide them educational materials on quitting. In Nevada, clients can be given information on the Nevada Tobacco Quitline or other cessation programs. This referral should also be documented in the client’s chart to make following up with the client at the next visit easy and convenient. Throughout the brief intervention, it is important for health care providers not to stigmatize or be critical of tobacco users. The goal of the brief intervention is to provide resources to those who want to quit and not to impart judgment on clients. Review the Educational Materials to see available tools and place an order. It is recommended that posters be hung in all waiting and exam rooms and that quit cards be distributed personally to clients by all clinic or hospital staff that interact with clients. Why do Brief Interventions work? 70% of all smokers see a clinician each year. 70% of smokers report wanting to quit and are just seeking the motivation to act. Studies show that smokers are four times more likely to quit smoking given successful brief interventions and professional assistance than if they attempted to quit on their own. Each intervention is at most three minutes long. This short duration is something that time-strapped physicians and nurses can commit to without abandoning other important services. For more information about brief tobacco use interventions, email to: TobaccoProgram@snhd.org or call (702) 759-1270. The role of the Quitline in the Brief Intervention program cannot be emphasized enough. The Quitline is the only statewide phone-based and online resource to which health care providers can refer; and as a free cessation service, it appeals to many people. The Nevada Tobacco Quitline is a free phone-based and online coaching service for any Nevada resident who is ready to quit tobacco. Information, referrals and coaching are confidential, and sessions are designed on a schedule that is convenient for quitters. For those that are eligible, free Nicotine Replacement Therapy is available to assist with the quit attempt. The Nevada Tobacco Quitline is available 7 days a week, 4am–10pm (PST). For more information, visit the Nevada Tobacco Quitline website. 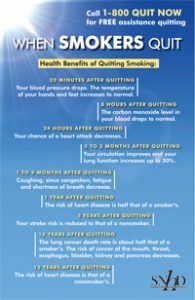 Posters and quit cards are available in English and Spanish. It is recommended that posters be hung in any and all waiting and exam rooms and that quit cards be distributed personally to clients by all clinic or hospital staff that interact with clients. To order free materials, contact the Tobacco Control Program at (702) 759-1270.